Tapped for these interview sessions were some of HCI’s most original thinkers. Clement Mok and Jakob Nielsen were asked to address the Web and Web design limits to humancomputer interaction (HCI). 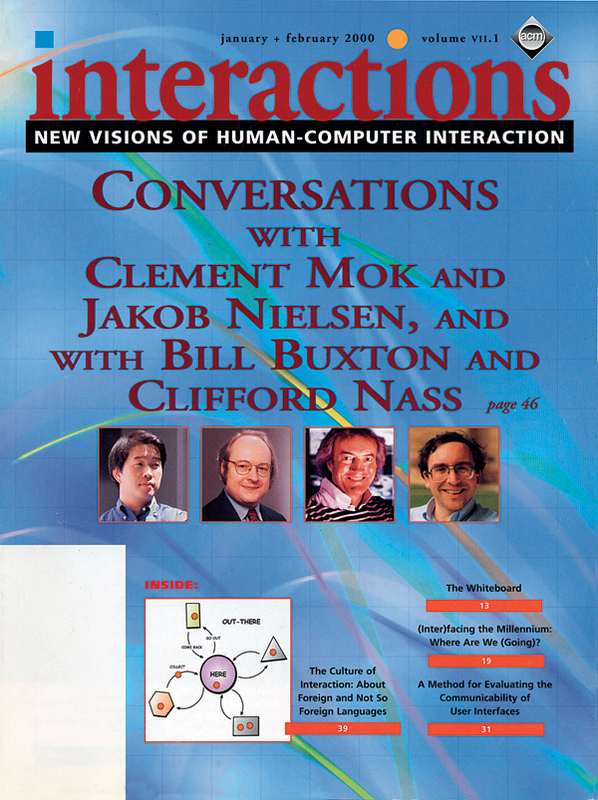 Bill Buxton and Clifford Nass tackled human limits to HCI. Wayne Gray and Bill Gaver compared their perspectives on methodological limits to HCI. And Don Norman and Janice Rohn squared off to address organizational limits to HCI. The interviewer was the Interviews Chair for CHI 99Richard Anderson, whose work is all about setting the stage for avoiding or overcoming limits to HCI and who has conducted several interview sessions over recent years on the stage of the BayCHI program. Two of those CHI 99 sessions are reproduced here. At least one of the other sessions will appear in an upcoming issue. The first session paired individuals who have come to the Web from very different places. Both have made impressive contributions to the Web and to Web design. Clement Mok is chief creative officer of Sapient Corporation, a consultancy that bills itself as the architects for the new economy. In 1988, Clement founded Clement Mok Designs, later renamed Studio Archetype, to establish clients’ digital presence using interactive media and eventually the Internet. (Studio Archetype was acquired by Sapient Corporation during 1998.) Before forming his own agency, Clement spent 5 years as a creative director at Apple Computer. Clement is the author of Designing Business: Multiple Media, Multiple Disciplines, published by Adobe Press. Jakob Nielsen is a principal of the Nielsen Norman Group, a user experience consultancy. Until July 1998 he was a Sun Microsystems Distinguished Engineer and the company’s Web usability guru. Jakob coined the term "discount usability engineering" and has invented several usability techniques for fast and inexpensive improvements to user interfaces. Jakob’s most recent book is titled Designing Web Usability: The Practice of Simplicity (New Riders Publishing). Richard Anderson: Are most Web sites well designed? Jakob Nielsen: Definitely no. My conclusion is that about 90 percent of all Web sites have miserable, miserable usability. That does not mean that the other 10 percent are great; it just means that they are acceptable. That also does not mean that users spend 90 percent of their time at bad Web sites. People spend most of their time at the good sites, but if you look across all Web sites, the vast, vast majority are extremely difficult to use. Clement Mok: I’m going to answer very much like a graphic designer as well as an art director: it depends. I honestly don’t think that our criteria for good Web site design have been determined. The very fact that we quickly make judgment calls about what is good reflects a bias; our judgments are loaded and are colored by a set of lenses. Jakob is from a constituency in this community that is coming to the Web from software development, while I and others come to the Web from the world of communication design. We both have a bias going into this world, and within those limited parameters say things like, "good is about clarity of communication;" or "good is about usability;" or "good is about performance," when in fact, a good Web site is all these things with nuances of gray in-between. Richard Anderson: Clement, in your book Designing Business, you talk about how old habits die hard. What are some of the old habits that you believe are holding us back or slowing things down in Web design? Clement Mok: Old habits holding us back reflect the things that we don’t know; we very often fall back on things that we know and have been very comfortable with. In looking at the Web and the Internet, each community or discipline needs to fundamentally look at their genetic makeup and their DNA and at what they consider "good" to be, and then challenge the assumptions on which they base their views. Jakob Nielsen: Actually, I think that a lot of the things that we do know are still waiting to be applied. This applies to the software…for example, makers of Web browsers still need to implement a lot of the things that we knew in the hypertext field 10 years ago. If we would just do what we know, we would get better browsers. Regarding Web sites, I’m leaning toward the view now that Web sites are just fundamentally never going to really make it. When I say "never," I mean in the next 10 years or so, because any substantial Web site is a contribution of a very large number of people. You can have a central design team in a company that is in charge of the home page and in charge of the information architecture and search and big picture kinds of things. In many companies, there are decent people working on these things who have a decent clue as to how to do them. So, those things may in fact be done well. But, take five clicks from the home page, and what are you going to get? Something horrible done by a product marketing manager in Kentucky. So the challenge is not just to get the central Web team back at headquarters to understand how to do good Web design, because we are achieving that via our speeches and books and consulting and such. The challenge is to get the thousands of people who are contributing their content to understand good Web design; that is a much harder challengea challenge that I don’t think will be met over the next 10 years. Intranet design is even worse, because there you have some random person in the next department creating Web pages. It’s a long time coming before we get all these people to understand how to do Web design well. Richard Anderson: Talk about some of the disciplines you both say need to be involved in the design of Web sites. What are some of them, and why should they be involved? Clement Mok: Let me start with just a few from my perspective. The Internet started out to be a communication medium, so the discipline and craft of communication design is apropos for Web site design. But the Web has evolved into a way of doing business, a way to conduct transactions. So skills that have to do with interaction design, software design, application design ... are needed. But those are just the surface disciplines. You also need to have a good understanding of the psychology and the social science behind how people interact with the world. Understanding the ergonomics of how something is used is not enough. The Internet and how we deal with the Internet is only a part of a bigger picture. We need to understand how it all fits in with our daily lives. That entire spectrum of disciplines is needed. It might be difficult to apply all disciplines on every single project. But when one looks at the projects out there and the kinds of Web sites that get implementedmany fall short because these disciplines are not applied. Jakob Nielsen: I agree that you need all these different disciplines. And you can add more. In the future, we will probably have more multimedia on the Web, so you will need people who know about film production or audio design. Right now, the Web is mostly visual design and text and information architecture, but we will keep adding as it changes. Today the Web is also the main driver for business strategy. So you also need people who understand business models. I’ve been known to make lots of snide remarks about marketing people. Actually, I make snide remarks about clueless marketing people. You need clued-in marketing people who understand that the Web is your connection to the customer. The user interface is your customer interface; the two are the same. Therefore, you need usability to be there, because if people can’t use the Web site, they are going to become customers of some other company. But the right business model also has to be there. On the other hand, we should not be saying that you can’t design any Web site unless you have a team of 50 people, including three Harvard MBAs. Sometimes just one person is enough. But in that case, you have to have all these little hats to put on. And you’ll need to put on your little usability hat once in awhile and say things like, "Let me go and get some other person in and see if they can use the site." So even if you’re the only person involved, you still need to get that outside perspective. Richard Anderson: Jakob, the working title of your upcoming book is Secrets of an Information Architect. What are some of those secrets? There are a lot of different levels of information architecture, and some of the more fine-grained levels may not be appreciated. The bigger level deals with how to structure the entire information space. That is often the focus of the professional information architect or is why you need several people on the team, because that’s not something that your average marketing person or average writer will be able to do. There is also information architecture in the small, like when you’re constructing a storylet’s say a product description. That product description should not just be a page, it should be a set of pages, and architecting that set of pages is information architecture in the small. This may not require a professional information architect; the marketing person might be appropriate for that level of information architecture. You can get even smaller to answer questions like, "When it’s just a few pages, how do you connect them?" An analogy is the work of an interior architect compared to the architect of the building; different people work at different levels. In information architecture, it’s specialized information architects for some things, Web site editors for others, and also people who are responsible just for a set of pages for a certain event, a product, or an article. Clement Mok: It’s interesting how information architecture has very different interpretations in different communities. At Sapient, we define information architecture very differently than Jakob just defined it. The practice of information architecture in our firm is also very different and is actually more specialized. We look at information architecture within the framework of a concept. Yes, we use the word "information," and we also use the word "architecture," but we look at the information architecture from the perspective of the user. We focus on user experience and on what users want out of their experience, and we do so within the framework of a concept as opposed to the thing being created. There needs to be more discourse about the language of information architecture, because it is a word that gets misused and has very, very different meanings within different communities. Richard Anderson: Jakob, you have written and also spoken lots about how people read on the Web, and you’ve said that too many sites are designed by print people with advertising backgrounds. What is or what should be the difference between Web design and print design? Jakob Nielsen: I think that there is a very large number of differences. There is the difference in page layout, where in print you have a fixed canvas you can work with, and the entire thing is immediately presented to the reader when the reader turns a page in a magazine. On the Web, download time dominates usability to a great extent, plus you don’t really know what the user has on-line, therefore you cannot control every pixel. Another difference lies in the writing of the words that go on a page or go into an article or go into a headline. When writing headlines for print, you can very often use teasers, puns…fun headlines, while that doesn’t really work in the Web. In the Web, you have to be much more straightforward and describe clearly, in that one headline, what the page is about, because people are not going to spend the time reading the rest of the page. In the Web, remember that the default is that you arrive at a bad page. When a user goes to a new page, on average it’s badon average it’s "Back" button time; users don’t give a second to decide whether they want to dig into the page. Sure, people also take a short amount of time to decide whether to dig into a print article, but they can more easily see the photo illustrations, because they are immediately there; in the Web, the illustrations are going to come downloading later. In print, it’s easier to read subheadings or additional text in addition to the big headline; on the Web, only a few things dominate. In a study I did recently with Mark Hurst, we looked at how people could apply for jobs online, and the result was horrible. In one example, the person proceeded through a series of steps and finally arrived on a page that had the headline that read, "You’ve now completed the job application." So what did the user do at this point? The user said, "Ah, good, I’m done," and closed the thing. Now if the user had bothered to read the body text, she would have seen "blah, blah, blah, blah, blah, blah, and by the way, we want to make sure that you are really sure this is the correct thing to do, so please press a confirm button to actually enter your application into the database." Nobody reads that body text. Users don’t click the last button that says, "Not only am I done, but I confirm that I’m done." The person went through all the steps, did all the work, and thought she was done because of the headline, and she lost all her work. Clement Mok: Jakob, you are drawing some very broad generalizations about things that don’t work. In the world of communication design, we consider appropriateness and context. What you said might be true for that job application, but you imply that it is applicable to every Web site. Attributes of tease and the ability to provoke or to communicate desirability or lust or ... all these things do and should play an important role in the Web. Jakob Nielsen:I think those things should be put elsewhere, not in headlines. Clement Mok: Put them elsewhere? Where? Jakob Nielsen: Well, you still have the body text, and you do have things like illustrations. Note that I don’t say "have no graphics;" I say, "minimize the graphics." Richard Anderson: Along those lines, Jakob, you say that of "look and feel" on the Web, "feel" is more important. Richard Anderson: Elaborate on that. Jakob Nielsen: Basically, the Web is a very user-driven environment. You go to a Web site to get what you want, when you want it, how you want it. That is the feeling of going to a Web site. So, if the Web site feels accommodating, feels that you’re in control, feels that it’s giving you what you want… that gives you a good, good feelinga good experience of being there. That feeling is to a great extent dominated by the simple fact of speed. Speed is not the only thing that matters, but it’s very important. If you just sit there and wait, whatever comes might be good, but you often get annoyed by the wait. In the studies, anyway, users say it’s not worthwhile waiting. You get this irritating feeling that this Web site is sluggish and that it’s slowing you down. You think that they think that they are more important than you are. They’re not really giving you service. It’s sort of like entering a physical store and finding sales clerks all dressed in fancy Armani suits and not wanting to talk to the customers. Now that’s a bad store. Those are not helpful sales clerks. Clement Mok: It’s really about relevancy and context. If you walk into a store where all the clerks have on white lab coats, you would still have a problem. You might think, "Wow, yeah, things are really efficient," because they all dress alike, they look like sales people, and you know how to find them. But that is just as much of a problem. It’s too clinical; it’s a very industrial-strength way of dealing with things. There is a warm-and-fuzzy component that needs to be there. In short, there are no absolute rules. The minute that everyone thinks there are and follows them, the Web will lose its relevancy for the user. Jakob Nielsen: I think it’s a matter of degree or where the main emphasis is. For example, with print, the "feel," so to speak, comes from leafing through the magazine. So it has some importance, but the "look" dominates. On the Web, because you are driving and you are moving, the "feel" dominates, which is not to say that the "look" is irrelevant. It’s a matter of the balance between the two components. Clement Mok: Consider an art gallery. If there’s no "look," it’s going to be hard for that art gallery to be compelling. Is that not true? Jakob Nielsen: On the other hand, consider the Web site of The Museum of Modern Art; that Web site is really unpleasant to use. For example, they don’t have the biggest part of their collection online. They do use thumbnails, but I don’t think they use them effectively. At least that was true when I looked at it a month ago. Clement Mok: Nothing is absolute. Jakob Nielsen: Okay. It is certainly true that if you want to be able to get to a high-resolution scan of a painting, that may in fact take a minute to download. But before you get to that, you want something that says there are these 10 or 20, or even better, a thousand paintings online for you to look at. Jakob Nielsen: On the other hand, if you don’t say these things, people are going to continue creating horrible, sluggish, Web designs. Richard Anderson: Clement, is the way that you design for the Web different than the way that you design for print? Clement Mok: Absolutely. I think it goes back to the absolute part and the nonabsolute part. Print is finite; it is an object that is not temporal. The Web, on the other hand, does not have a sense of permanence; it is quite ephemeral. A Web site is not only a framework and a structure you plug components into over time. It evolves and morphs in ways that make it hard to get a sense of what this one thing is at any one point. The fundamental difference is that what you are designing does not have a permanent state; it is fluid and has different dimensions over time. It is, in fact, closer to performance art; it’s hard to describe what performance art is at any one point, because it is constantly in flux. Richard Anderson: What do you consider to be the role of the designer? What is the responsibility of the designer? Clement Mok: Facilitate, mediate, inspire. Jakob Nielsen: Also to take the users’ roleto be the users’ advocate on a project. A lot of other people on projects are all focusing on what the company wants, such as dumping lots of messages on the poor user. Again, the Web is so user-controlled, users are going to go where they want to go. But that fact is still new to most business people. The designers are the ones who have to stand up for the user and say that we have to make it easier for people to get here, or we have to present information in a way that makes sense to someone who does not work at this company and does not understand all our special terminology. In the various project meetings, designers have to stand up for the poor users because they are not there. Hopefully, every now and then they are brought in for a usability test. But, on a day-to-day basis, it’s the designer’s responsibility to stand up for the user. Richard Anderson: Clement, in your book you talk about how some of the disciplines that you believe need to be involved in Web design are not necessarily prone to collaboration. Is creative design such a discipline? Clement Mok: Graphic designers as well as software designers are trained and genetically engineered to be solo pilots. They sort of meet and get the brief; then they go off and do their magic. And I think engineers are that way, too. Inherently, and given the training that people have had, it is about being starsabout individually creating great experiences. The Web is so complicated with its many interdependencies that it’s important to not only nurture the great creative individuals, but to also create the great squadrons and the squadron leaders. Richard Anderson: Are usability engineers prone to collaboration? Jakob Nielsen: That’s an interesting question. Usability, at least if you take it seriously, is about understanding different perspectives and understanding how other people think. So, theoretically, usability engineers are better at collaboration. They can still argue and say, "No, this is how it has to be," and they can get very stubborn sometimes because all experience and 20 years of research show that the download time has to be this fast. Indeed, that is something I’m going to stand on also. Richard Anderson: How do you achieve collaboration? What is the secret to getting people to collaborate? Clement Mok: Collaboration, I think, requires engaging the individual or the group to take on a change. The minute that the metalevel of understanding within the group that the group is about to do this one thing is not there, collaboration is not going to work. When people are in disagreement, they don’t buy-in at the metalevel that they are about to alter something fundamentally. You have to operate at a concept level so that people are engaged and ready to accept a change. Another piece of the equation is about communication and really listening, and about creating a forum in which disagreement can happen. Agree to disagree, and create a respectful environment to facilitate that. You can agree to disagree without having the respectful environment; that will destroy collaboration. Last but not least, I think you actually have to have a physical space in which you physically work together. Jakob Nielsen: I also think that having some sort of external criterion for how to proceed can help. Otherwise, you risk everyone arguing against each other: should we do this or should we do that? And everyone might argue until the cows come home. This is where the user becomes quite important. If our main goal is to create the optimal user experienceto really satisfy customers, then that can become the decision criterion. If you have that idea, and we have this ideawell, they are both good ideas. What will be decided will depend on what actually gets the users their results faster, or on what sells more, which I guess is ultimately often the goal. Having that external decision criterion is important so that the decision is not based on who can argue the strongest. Richard Anderson: Jakob, you have said that you believe that 80 percent of the Fortune 500 companies will fail, because they won’t make the transition from the visible world to the virtual world. Richard Anderson: Say some more about that. Jakob Nielsen: I think that most big corporations are doomed when it comes to the Internet, because the Internet is an environment in which you are extremely close to the customer. It’s about direct contact. Yet these big companies have lots of layers of insulation between their decision makers and the actual customers. The decision makers never see a customer in most of these places. And in most of these places, the way to get promoted is not by doing something good for the customers, but by being smarter than the other vice president. That kind of organizational structure may have actually worked very well in the past when change was very slow, when things moved very slowly, and when sheer mass of scale had major benefits. The Web is a much faster moving thing. Tight contact with the customer is becoming much more important. In the old days, you could send out sales people to schmooze the customers on the golf course, and that’s how you could overcome the fact that the company didn’t really care about its customers. Nowadays, if you don’t care about your customers, it is blatantly obvious from the Web site, because it is not customer oriented, and people just go to some other place instead. So most of these big companies are genetically suited to work in an old-style, industrial environment; they are not well suited to work in an interactive environment where the quality of customer service and truly caring about the customer is the important thing. The 100 or so of them that will survive will be the ones in which the CEO decides that the Internet is the future. If there is a channel conflict, too badwe are going to go for it anyway. We are going to kill our own internal departments instead of having someone else kill them. Most companies are not willing to do that. Clement Mok: I agree with you on many of your points. But when you talk about failure, are you saying these companies will just go away, or are they going to have to deal with how they fundamentally operate their business and with how to interact with the customer through another intermediary? Are they going to have to look at who they are, what their brand is about, and building customer confidence? Jakob Nielsen: There are probably several different transition strategies. One strategy is to start up another brand and sort of feed it, but basically it will grow up to be a new thing. And then you can argue, wasn’t it really the old company that transversed into a new company? Maybe it was, and if companies do that, and if you look at it that way, the survival rate might be greater. But the old company is still going to shiver and become much smaller than it is now. I’m not so sure that 80 percent of these Fortune 500 companies will die, in the sense that they will have no revenue in 10 years or 20 years. But I think they will disappear from the list; they will be so much smaller. What are the new companies that are going to grow up instead? Well, some might be spin-offs of some of these old companies. In many cases, they will just be completely new companies. Those who are really doing well on the Web today are almost all Internet-only companiescompanies that are pure, pure Internet. People often ask me for the secret of Amazon.com: how come they are so much better than anyone else? I don’t think they have any secret other than that user experience is their number one criterion: does this make it easier for people to buy a book or more difficult for people to buy a book? That is how they decide what to do. All the older companies have all these impediments in place that make it difficult for them to have this one criterion of "are we going to make this easier for our customers or not?" They have five other criteria to think about as well. Richard Anderson: Jakob, you have argued that very few companies really understand how to use the Web or how to compete on the Web. Yet, you have argued that companies must keep Web agencies on a tight leash. Shouldn’t it actually be the other way around, to the extent that that is possible? Jakob Nielsen: Well, maybe you’re right. It’s probably true in both directions. People like Clement are the ones who actually understand what they are doing to the Web. So they can be responsible for managing their clients or getting them to understand what to do. I put it the other way around, saying that the company has to closely manage the agencies, because you also have this phenomenon where some people just go off and build a Web sitesometimes a very nice Web site, but one that is disconnected from the company. That does not affect the mental change needed for transformation into a Net-centric corporate culture. You can have a Web site that looks wonderful and may actually do a few things very wonderfully, but if it’s disconnected from the base company, the base company is never going to be very good. You can see this in a lot of the airline reservation sites. They are doing nice things on the front end, but the back end is not intended for consumers. So it is never going to be a really good travel agency online. That is why I say that the company must decide it is going to be an Internet company and that it is going to be in control of its projects. Clement Mok: The way that Jakob is talking about these relationships is very interesting. In the world that I come from, it’s called, "managing brandmanaging and extending the brand experience." Really talking about what a company’s brand attributes are and what they might be allows a company to move into these new spaces. Let’s say that McDonald’s wants to create a personal information management Web site; McDonald’s brand is not going to allow them to do that with credibility even if they are able to develop the best user experience. It is about the connections to and relevancy with the brand that existed in the analog world; it is about what those relationships are and how they’re managed and about how well brand attributes transfer. At the same time, interaction with the customer online creates new brand attributes that influence the dirt-world brand. Take UPS as an example, which took the effort to go after Federal Express by developing a robust Web site. Now perhaps as competitive as Federal Express, they have developed brand attributes of being a major technology player that have transferred to their dirt-world presence. I don’t think too many people are really looking at how significant such changes can be. Jakob Nielsen: I think you’re right, that doing a good job on your online press can reflect back on your old-world press and say, "Yes, this is an efficient company, and, for example, we can get your package out, and you can track your package ..." On the other hand, it might play the other way around, which for some other companies is often the case. Some companies try to develop a brand of being very welcoming, very serving to their customers. But, go to their Web site, and you basically can’t do a thing. I think that is hurting these companies’ brands in a lot of cases. Richard Anderson: Jakob, you’ve described the Web as a "low trust society." What do you mean by that? Jakob Nielsen: The Web is a low trust society, because you click in something and you get something in response, but how do you have any clue whether it is any good? Not only thatthe current atmosphere of the Web is that of utter disrespect for people’s rights. It’s like, "let’s trick people into giving us their e-mail addresses, then we’ll spam them forever after." There are all these little boxes that say "yes, I want a good offer," but do you have any idea what you will get if you check those boxes. It’s too much about conning users caught up in the Web; it’s not about true disclosure about what’s going on, such as saying "every two weeks we’re going to send you a certain type of message." Plus, there’s a lot of horse trading with various Web sites. For example, Alexa, which is sitting on a vast database of personal information, was recently bought by Amazon.com. We may have had great trust in the previous managementmaybe they’re still in place, maybe they are very nice people. I have nothing against them knowing what Web sites I visit. However, Amazon.com might decide that was not a good investment next month and will decide to sell them to some evil empire. The point is that users are being traded like cattle, and as long as that’s the attitude on the Web, that we’re eyeballs, that we’re not really customers, that we’re not really individuals, that we’re not really treasure, that we’re like a Third World colony set to be strip minedas long as that is the attitude on the Web, users’ trust will drop and drop and drop, and people will become more and more distrustful of any kind of offer or promotion that is attempted. Banner ads are a great example of that, because users have this notion that if they select a banner ad they are going to get junkthey’re not going to get what was being offered. This is despite the fact that there are some ethical advertisers, including the CHI conference which advertised this session via a banner ad, and sure enough, it’s happening. But so many other advertisers are not ethical; for example, they advertise, "Click here to speed up your Internet connection" or whatever, and you click there, and it’s just an ad for some stupid thing you would never want. You get a few of those, and at the end of the day, you say you will never click on an ad again. Clement Mok: I think there is another dimension to trust. Trust is lost very quickly, but trust is also built up very quickly. Amazon.com and eBay have made explicit disclosures about what they are going to do with the information users provide. This has affected the amount of users’ trust; this affected beliefs about how they conduct business and what they are as companies. The building of trust in those brands was accelerated. But, at the same time, technology can accelerate a loss of trust and confidence in a brand if many key principles are violated. Jakob Nielsen: I agree that you can build trust in the Web if you faithfully follow up on all your commitments. But the Web in general is really suffering from this kind of low trust; it is a distrustful environment where people are very skeptical about any promises that are made. However, Amazon is a company that continues to follow up; people have this notion that if they order something from it, two days later it will be there. I’ve gotten a lot of e-mail about a certain other bookstore about its claims that books are in stock. People have said that they looked for a book on Amazon.com, which didn’t have it or said it would take three weeks to deliver. So, they went to this other bookstore instead, which said, "Yes, we have it in stock and will ship it in two days." So they bought it at this other bookstore. What happens? Three weeks went by before they got the book. In effect, the bookstore lied to them. Whether the bookstore lied to them because the book was in stock until a half a second before they ordered it we will never know. But those particular customers will never buy at that bookstore again. Clement Mok: The whole issue of fulfillment and of reliability of information is an important piece of what I think is a very complex puzzle about trust. Richard Anderson: How might we get away from banner ads? Is that a possibility? Jakob Nielsen: My answer is micro-payments. Those who pay are the ultimate customers and will ultimately be the ones things will be designed for. I don’t think we can develop what is going to be the most important communication medium in the world if it is purely advertising based. That medium is not going to serve societyit is not going to serve people. Unfortunately, people will have to pay, and they just have to recognize that there is no such thing as a free lunch. If you want to have a service that is paid for by advertising, it is going to be designed for advertising. Articles are not going to be written in a way to give you the best information; instead, they will be chopped up in little unpleasant page views to maximize the number of advertising exposures. This will get worse and worse as the click-through rates drop and drop and drop. My prediction is that the click-through rate will be cut in half every year and will reach 0.1 percent in 2001. And as the click-through rate drops and drops, there will be more and more devious things done; advertisers will try to squeeze a little bit of revenue out of all those eyeballs. Clement Mok: Two weeks ago, I was sitting on a panel with representatives of ad agencies, and they were asking exactly the same questions. "What do we do with banner advertising? Is there going to be new kinds of banner advertising?" It was fascinating to hear that they could not think out-of-the-box and were instead thinking there will need to be different forms of direct marketing and more advertising formats for and different ways to treat banner advertising. Their solution is to not look to banner advertising, but to look at what they need to do to develop an ongoing conversation and relationship with their customers. Until advertisers get burned so bad and spend so many advertising dollars without getting any return on their investment, we will continue to suffer from this whole notion of having banner ads and interstitials and all sorts of other funny words; say, what the hell are those things? Jakob Nielsen: They are just making worse adsmore and more intrusive, more and more annoying ads. I think people will react more and more against thatbuying software that screens out the ads, for example. That should be seen as the final cry for help. If it’s so bad that people actually pay money for software to get rid of these ads, that’s a true sign that this entire strategy has failed. And, Clement, your comment about relationships with customers is such a key point. Good relationships are not based on taking out your club and banging a customer over the head. If you want to have a good relationship with a customer, you don’t start out by cheating them, which is what many of these current ads are doing. Your approach needs to be more trustful, more relationship based. Think of it more as marketing and less as advertising. Build up Web sites that actually give customers good service. That, I think, is a very, very viable strategy. However, that means that content Web sites are going to lose their revenue sources. They had better think of other revenue streams. Richard Anderson: You made a quick reference to micro-payments. Can you say a little bit more about those? Jakob Nielsen: The main problem with micro-payments is that there are too many schemes right now. It’s not that there are any technical problems. Too many different schemes have been invented. I think that Microsoft has abandoned their responsibility to lead the industry here. They should decide on one of them, put it into the operating system, and just ship it from now on. That is the only way it is going to work. People are not going to download something to plug into stuffthat just doesn’t work. You can say good things about Bill Gates or bad things about Bill Gates, but the fact is that he rules the world. So, it is his job to just pick one of them. I don’t even care which one. My favorite is MilliCent, but I don’t really care. Just pick one of them, and stick it into the OS. Then the OS can become the enabling mechanism for the network economy. If it’s not done properly, it’s not going to work. Actually, the Microsoft antitrust suit that is going on is interesting, because it hinges on a user interface question: should the Internet really be part of the operating system? Should the browser be integrated or not? Despite it being a user interface lawsuit, none of the parties have dared call a user interface witness. I think it is because both of them know they would be in deep trouble. If the government called me as a witness, I would say, "Sure you need to integrate the browser with the operating system; kick out this stupid lawsuitit’s without merit." On the other hand, Microsoft wouldn’t like to have me there, because I would also say that this so-called integration is just a little Band-Aid. We want real integration. I can give them a list of 10 additional things they need in the next version. Richard Anderson: Studio Archetype conducted a study with Cheskin Research on the trustworthiness of e-commerce. Say some more, Clement, about that study. Clement Mok: A client had come to us and said, "Design a very secure site for us, and design it so it looks like it is secure." What??? "Looks like it is secure?" That confounded us. Isn’t it enough to make a Web site secure? The answer is "no." We decided we would conduct surveys, do focus groups, etc., to try to understand what people identify as trustworthy. We talked to a variety of peoplefrom people within the industry to total novicesabout what they felt was important to building trust. We found that many of the things we had thought were important, like security encryption, are important, but we also found that building and destroying trust happens in a short amount of time in this Internet space. Technology performance plays a role, security marks play a role, brand plays a role ... but navigation plays the most significant role in shaping trust. You can have a no-name brand, a teeny tiny company, but if you make your Web site very clear and easy to navigate, you can build up trust very quickly. People’s response to several well-known brands was miserable. For example, people couldn’t find any product in the SharperImage.com Web site, and they rated the company very low as to the extent to which it was trustworthy to transact business with. That navigation was of greatest significance was the most surprising finding. Jakob Nielsen: To me, that says that if you make it usable, then people will feel more welcome and will trust it more. The analogy with the physical, old-fashioned shop is that if you have salespeople who are helpful, that is better, and if you have salespeople who refuse to talk with you, and you get this feeling that they have something to hide, this is not a site that really will work and where you can get things done. Although Clement didn’t say this, their report about the e-commerce trust study is available on the Sapient Web site, and I think it is a very good report. Richard Anderson: Studio Archetype has a discipline called "brand strategy." What does a brand strategist do? Clement Mok: Brand strategy is about trying to reconcile the brand attributes in the dirt world with the brand attributes in this new digital world. What is the tone of the conversation between the two? It can be a friendly conversation or a very hostile conversation. What it is can shape what a brand does and determine whether the attributes are relevant or have credibility. Brand strategists within our firm look at this space for companies that are like deer standing in a vehicle’s headlights and being told to go changeto do something on the Internet or they won’t continue to exist as a business. We are helping companies find and articulate their brand attributes in the dirt world and in the Internet space, then figure out a path forward as to how to change or build customer perceptions. Brand strategists mind those relationships with clients. Richard Anderson: Jakob, I think I’ve seen you quoted as saying that companies are preoccupied with branding. Jakob Nielsen: Well, I’m not sure I said that exactly, but they probably are. The potential downside to branding is that some people think of branding as image. What I claim branding really is is the customers’ impression of you and what they actually get from youin other words, the actual experience. This goes back to the question of whether look or feel is more important. The feel, or what you actually get, is in many ways what determines the true brand in the long term. Let’s take an airline as an example. The airline can run a million ads that say their planes are always on time, but if there is an hour delay every time you fly with the airline, at the end of a very small number of trips you would say that this is not a reliable airline. It’s similar with the Web; every single click is delivering some service to the customer. Therefore, the feeling of the delivery of that service determines the brand much more than that which some people who talk about brand get more preoccupied with. They’re preoccupied with the superficial aspects of branding, such as how big our logo on the home page is. They ignore the substantial aspects of branding, which are about promising the user or customer a certain thing, and then delivering it. If you do not deliver it, people will very quickly learn to ignore you, because they get bombarded with so many messages in modern society. Clement Mok: The great digital brands are going to be about companies who actually manage reliabilityreliability of providing valuable information. There will be variations, but as we move forward, the great brands will be about reliability rather than just quality. Richard Anderson: Jakob, one of your columns is entitled "Personalization is Overrated." Is it really? Jakob Nielsen: Personalization is overrated, because it is the bad excuse of the person who can’t design a good Web site. It’s like, I can’t figure out what to show to the user, so we can just leave it up to them; since I don’t know to design it, I’m sure the user can do it. That is basically the attitude you find in some places. It is the responsibility of the Web designer to design that experience, that environment, for the user, so that the user can then take or enter that environment and get what they want. A navigable environment in which you can actually figure out what to do and get what you want now is the more important goal. That does not mean that there should be no customization features. It is very nice for users to get in and tweak the design: let me see more of this or less of that, or let me always get the weather forecast from my home town, and so forth. I do believe in that type of customization. What I do not believe in are the cases where the system is trying to model or second-guess the user and stereotype them. Do you know the infamous thing on Amazon.com that says, "Welcome back, Jakob, except if you’re not Jakob, click here"? It goes on to say that you really should buy these crime novels. I don’t really care about crime novels. Yes, I bought quite a lot last week, but they were for a birthday present for somebody else. It’s trying to be too smart about it. What is very good is that for every book they list, they also list five other relevant books. Every day you are interested in some other thing: today I am interested in this book, so here are five other books that are relevant. That is a way of being driven by the users’ immediate needs and requirements. When you study these things with users, you will quite often get feedback that says, "Don’t box me in; I’m not just that person; I have broader perspectives and views." So, I’m not saying there should be no customization features; they can be useful. I’m just saying to not rely on customization as the main design strategy to overcome deficiencies in simple navigation. Clement Mok: Another way to cut what Jakob is talking about is, in my world, called "point of vieweditorial voice." People still like to be led through information and resources that have a very distinct point of view. That piece of the equation is often missing. Richard Anderson: Clement, who has influenced your work and your perspective a lot? Who are the people you have greatly admiredpeople who have influenced the perspective that you are sharing with us today. Clement Mok: A lot of people. One is Steve Jobsactually, not Steve Jobs himself, but the Macintosh team. Being part of that team shaped the way that I look at the world of designing the entire user experience. It is not just about the screen or the graphics; it is about looking at how the machine, the box of that machine, and its contents fit within the space. It is about the supporting tutorial that goes along with the machine, and about all the demos. It is my focus on the totality of the experience and the need to work together to create great experiences that Steve and the entire Macintosh team influenced. Others who influenced me were the husband-and-wife team of Charles and Ray Eames. They are designers. They try to connect the most mundane day-to-day things with technology that is useful and desirable. They have designed films. In 62, they did an amazing multi-image show with 30 some-odd projectors at the U.S. Pavilion in New York City, which in a way was the start of the multimedia movement. And they did the powers of ten. They have looked at technology not as the end, but as the meansthe means to connect. Making connectionsmaking meaningful connectionsis so important. Richard Anderson: Jakob, same question. Jakob Nielsen: Back when I was a student, I read a lot of Ted Nelson’s books: Dream Machines, Literary Machines, and those books. They influenced me a lot and actually got me into hypertext. He was extremely visionary, even though he never actually shipped anything, which doesn’t matter because he wrote some very, very good books. The other person I’ll mention is John Gould at the IBM Watson Research Center. I’m actually very different from John, because I don’t go around measuring everything very carefully. He did. He believed that anything you could have a discussion about could be measured. He did some extremely careful studies on how people read from computer screens versus paper, and varied every possible parameter of all that, to finally discover the need to have better resolution. We still don’t have that needed resolution, even though the need has been known since his studies were presented at one of our early CHI conferences. It is a disgrace that we still have such bad screens. John was really a great…I was a great admirer of him. I learned a lot from John Gould even though I’m not doing things in his exact style. I am more into the "let’s do some quick-and-dirty kind of thing, and get the insight," rather than get all the numbers John would have wanted. People like Jack Carroll, Tom Landauer, and Tog [Bruce Tognazzini] how can you not say Tog?also influenced me. Lots of good people. Richard Anderson: In a very recent interview, Clement, you talked about how you learned about humility as a student. What role should humility play in the wild world of Web design? Clement Mok: None of us know where we are going. You don’t know what you don’t know. We are colored by our past experiences, and we can go out and claim that we know everything and that this is the way it should be. I have done that; we have all done that. It is a part of human nature. It’s easy. It’s much harder to ask, "Why not?" When we take on a project, we ask our clients the appropriate list of questions, such as "Why are you doing this?" and "What’s the business objective?" When someone off the cuff throws in something that appears to be audacious and bizarre, we totally discount it. In some projects, that something was a brilliant idea, but we just threw it out the door. We should have looked at it and asked, "Why not?" That is how the bold and bright and extraordinary ideas come about. Ted Nelson and Marc Andressen [inventor of Mosaic and co-founder of Netscape] are two people who asked, "Why not?" The Web is the result of asking, "Why not?" Humility comes from failing to and then seeing that you didn’t ask the "Why not?" question. That is when you say, "Yeah, I messed up big time." Richard Anderson: How has humility played a role in your work, Jakob? Jakob Nielsen: Well, I don’t know. Clement is certainly right that there is a lot of stuff we don’t know, particularly about the Web, because it is so understudied. It is amazing that you have hundreds of millions of people using the same system, and we don’t really know why. On the other hand, there are a lot of things we do know, and I think it is more my responsibility to go out and say, "People, this is wrong; this is what you should do." Even if it’s only 90 percent sure to be true, it still has a much better chance of moving people in the right direction, rather than overlooking these things. If in 99 percent of the cases that you make download times faster you also make user experience better, you might as well tell people that. Otherwise, they are not going to pay attention to that issue. The concept of humility does play a big role in Web design. You have to remember that when you’re designing a Web site, you’re designing this little speck of dust in the universe of the entire Internet. You’re contributing a tiny little minuscule increment to this bigger user experience. I call this Jakob’s Law. Jakob’s Law of User Experience is that users spend most of their time on other Web sites. No matter who you are, people spend most of their time on other Web sites. That says to me that you cannot drive the user; they spend most of their time elsewhere. Clement Mok: Jakob, what if your "‘99 percent" is wrong? What if it is only 85 percent? Clement Mok: But broadband and many other things are coming down the pipe very soon. Hence, I think that dictum of 99 percent with regard to download time is irrelevant. Jakob Nielsen: But the download time issue will always be with us, because it is based on basic human characteristics. The one-second response time rule says that anything slower than one second is going to feel unpleasant, is going to feel sluggish. Even if you can say for sure that at some point in time we will have enough bandwidth to send a current Web page in a second, I’m sure some designers will find a way of making it a fancier page that is slower to download. Eventually, you’ll be right, but that will be more than 10 years from now. Audience Member: I wonder if the window of opportunity to fix the Web is closing. I wonder if (a) people will so totally mistrust it, that all will abandon it, or (b) we’ll just accept it, with the poor performance it has. After all, we all still shop in stores where people are unhelpful and either wear fancy suits or white lab coats, and those stores seem to be doing quite well. Jakob Nielsen: I don’t think it’s too late. I really believe we are still in the infancy of the Web, and it’s going to become much bigger and much better. I really believe that the Web is the ultimate consumer empowerment medium, because every single mouse click is a vote for what’s good and what’s bad. That drives the traffic to a better Web site, and the worse sites fade away a little bit. I am very optimistic. As new things come out, the better Web sites will bubble to the surface, and the poor ones will fade away. That is also why I think, by the way, that the current stock market valuations are problematic. There is this notion that whomever is sitting on a good market share now will inevitably have good market share in the future. But, there is very little loyalty on the Web, and if something better comes along, people are going to go there instead. Audience Member: Many leaders of the information economy seem to bemoan the fact that the Web and the Internet have not become the pervasive, ubiquitous appliances that they expected, or that it’s taking longer than they expected. Do you think the obstacle is financialthat people can’t yet afford the technology for it to become ubiquitous? Or is it the bandwidth? Or is it the lack of really useful stuff for people to do online? Clement Mok: All of those things, but patience is virtue. Adoption sometimes takes 10 years. Consider the penpoint operating system; it actually started in 1990 or 1991. Things take a bit of time. But, indeed, a lack of useful, usable, and desirable things on the Net is preventing it from being ubiquitous. Jakob Nielsen: I agree. But I think that the cost is also an issue, because it is still too expensiveparticularly overseas. On the other hand, that is the one thing we know will go away. If all other problems in society were like that, we would be happy. Ten years from now, the computer will cost 1 percent of what it costs today. So, that problem will go away. A much more serious issue is not being addressed very well right now. Some of the recent data from Denmark says that personal computers are now in 52 percent of all Danish households. That is only 3 percent more households than 2 years ago. So, there has only been a minuscule number of additional households getting a PC. Sales are still strong, but that is because the same households that already had a PC 2 years ago are buying more. So, basically, the other half of the population are just not buying. It’s a mix of lack of motivation, because there is nothing for them there, along with a matter of things being too difficult for them. If you compare the user interfaces of Windows 95 and Windows 98, the incremental increase in usability might in fact be 3 percent. To get the other half of the population to go on-line, these systems need to be more than just a little bit betterthey have to be enormously better. That is what we are still waiting for. There are certainly projects under way to make systems enormously better. But, right now, they are just too difficult to use. Audience Member: You’ve talked about how to get people to agree when they are collaborating, and about the trust issue, and about banner ads and how we might get away from them. I think it all comes down to getting better data. In the trenches, when you’re working with the ad sales people and the producers and the designers and the engineers, and there is disagreement about what should be on the page and about where the ads should go, what do you do? There is such a paucity of information out there right now. It’s very hard for me to argue to the sales people why we don’t need the banner at the top or why we don’t need the sponsorships on the side. Because I have no data to support my claims, they don’t believe me. This is a call to action to the community to do more studies, to identify the things that will enable users to get what they want and advertisers to get what they want. Jakob Nielsen: I agree. There is incredibly little research being done on how people use the Web and why people use the Web. There is some amount of usability testing being done that affects individual designs, but there is not much generalization happening. Yes, we need more. And I guess we do need more data about what makes advertising work well, even though I think banner advertising on the Web is a doomed endeavor. Audience Member: Though our field is a little over 20 years old at this point, I have been a little bit disappointed in how much progress we have madein how much impact we’ve had on the computer industry. I would have hoped that by this time we would have institutionalized usability as part of software development, but I don’t think we are anywhere near that. My bigger disappointment is that when the Web really began to take off, which was only a couple of years ago, there was no evidence that our 20 years of experience had any impact at all on Web design. I’m wondering if you have any hypothesis about why no impact was made when the Web first started to take off, and about how we can do better in the next 10 years. Jakob Nielsen: Usability has never been a success in computer companies, because they haven’t cared about customers. They have been able to get away with that, because the customers let them get away with it. Because the people who buy the software don’t really know or understand how it is being used, and for lots of other reasons, computer companies don’t need to make usability their guiding criterion. The Web is a little bit different. On the Web, usability is becoming a guiding criterion for quite a number of companies. In the beginning of the Web, this was not the case. At the beginning of the Web, everyone was so excited: "Wow, I can put stuff up, and people in New Zealand can see it." They never thought about how it was going to be used. There was a revolution just in the fact that you could put stuff up. That is probably why usability was downplayed in the very early years of the Web, and why wild experimentation, which was probably appropriate for that stage of the Web, was up-played. People tried all kinds of odd things, most of which didn’t work, but that was fine for the pioneering stage. We have now entered the stage of attending to the business critical aspects of things, like whether you keep your customers and whether people can find products. Usability is critical on e-commerce sites, because if people can’t find the products, they are not going to buy them. You can now tell that a large number of companies are, in fact, making usability a very major, major issue in the management of the Web. Internet-only companies certainly are, but so are some old-world companies.